Not all broadband services and ISPs are the same. Choosing the right (fastest) service is generally much more important than choosing between ISPs. However, selecting a good ISP will ensure that you maximise your broadband speeds and stand the best possible chance of fixing any faults that you have (or may have in the future) on your line. New! If you are specifically looking for the best fibre broadband service, then please view our new Which Fibre ISP? page. The broadband choices available to you will depend on where you are located. In general, if you live in a town or city, you will have many more choices available to you than if you live in a rural location. basic ADSL services delivered via BT's ADSL network and offered by BT Broadband and a raft of ISPs. Surprisingly, many people are unaware that the latest (and fastest) broadband services are now available to them. Even if superfast broadband is not yet available in your area, there is generally no cost in upgrading from ADSL to ADSL2+ services. Superfast broadband services offer the very best speeds available and prices are now surprisingly affordable. If superfast broadband is available in your area, we strongly recommend that you opt for this. Currently, government and public funding is being used to expand BT's fibre broadband footprint to beyond 90% (and beyond) of UK premises by 2015. As described in our What is Fibre Broadband page, BT's Fibre to the Cabinet (FTTC) service delivers download speeds of up to 76 Mbps (with upload speeds up to 19 Mbps). The price for superfast broadband may be substantially lower than you may think. In its its report on broadband, Ofcom found that the difference between the monthly rental fees for ISPs’ lowest-cost ‘superfast’ services and their lowest-cost ‘current generation’ services is often relatively modest. Currently, there are many offers to tempt consumers to fibre broadband. Particularly if you are prepared to change ISP, you may find that you will pay less with a new ISP for fibre broadband than you do now for conventional broadband! BT Broadband is the biggest fibre broadband ISP. For the latest BT fibre broadband deals, visit the BT Broadband website. If you are seeking a cheaper, low-risk option, Plusnet is actually owned by BT but generally offers cheaper fibre broadband packages than BT. For the latest Plusnet deals, visit the Plusnet website. In the absence of superfast broadband services, you will generally be reliant upon ADSL technology (or the more modern ADSL2+ technology) for the delivery of your broadband service, with a large range of ISP options. ADSL2+ is an enhancement to the original ADSL technology that is widely in use. If superfast services are not available, we recommend that you seek out ADSL2+ services. 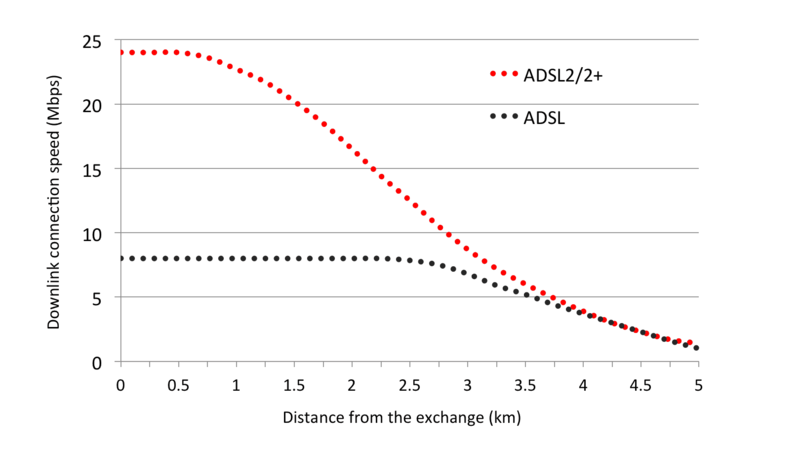 As discussed in our Chart of ADSL and ADSL2+ speed versus distance page, ADSL2+ can deliver significantly higher download speeds than basic ADSL, particularly if you are located relatively close to your local telephone exchange. There may be a number of way in which you can get ADSL2+ services, which are now described. Local Loop Unbundling is the process whereby other operators (such as Sky Broadband and TalkTalk) place their own equipment in BT exchanges so that they can offer their own services with more control. LLU services use ADSL2+ technology so can offer superior speeds in exchanges where BT-based services only use ADSL technology. Sky Broadband and TalkTalk offer competitively-priced services bundling telephone, broadband and TV. You can check the availability of LLU broadband services in your area by using the Sam Knows UK exchange search, and you can also check the latest offers from the Sky and TalkTalk sites. If you opt for unbundled ADSL2+, do not make the assumption that you have to go with the available provider, as there may be a number of additional options available. For example, TalkTalk provides wholesale services (just as BT does) to a number of ISPs that provide superior customer care such as Xilo (which is rated as the top ISP in ISPReview's top ten list of ISPs ranked in terms of customer feedback). BT has been upgrading its exchange equipment from ADSL to ADSL2+, so check the current status of your exchange using the Sam Knows UK exchange checker. Of the available options using BT's ADSL2+ network, BT Broadband is the most popular. BT Broadband is the biggest broadband ISP with about 7 million customers. BT broadband customers receive ‘free’ access to the new BT Sports channels on multiple devices (via fibre broadband and Sky boxes), and some sports enthusiasts may be swayed by the availability of sports content. BT currently relies on overseas call centres and the quality of telephone support is variable. However, customers can often get a much better response online using the BT Customer Support Community Forum. For the latest information about current BT prices and offers, visit the BT Broadband website. Which ISP should I choose for ADSL services based on BT's network? If only BT-based ADSL services are available from your exchange, then you still have to make a choice of ISP, to get high-quality customer care and the fastest throughputs possible for your broadband connection. As previously mentioned, BT Broadband is the biggest broadband ISP. Just as with all the largest ISPs, telephone support can be somewhat problematic. Fortunately, customers can often get a much better response online using the BT Customer Support Community Forum. For the latest information about current BT prices and offers, visit the BT Broadband website. There can be advantages from considering a smaller ISP, and a number of smaller ISPs have developed a solid reputation for delivering excellent customer support. Xilo and Zen Internet are regarded very highly. When you have a fault on your line, it can be very frustrating getting many large ISPs to take proactive actions (for example, sending out a BT Openreach engineer to your premises) to resolve the fault. higher priority on BT's network than IPStream Max connections, to maximise throughput speeds in busy periods. Taking account of all these factors, if you really want the fastest speeds, our current recommendation is to consider one of the Office Broadband services offered by Xilo, which are based upon IP Stream Max Premium. Xilo has a reputation for providing excellent UK-based customer services, 832 kbps uplink connection speed, no traffic shaping and priority through BT's network. Don't forget to read our Increase Broadband Speed Guide to get the very highest speed from your broadband connection. Our WiFi Optimisation Guide will ensure that WiFi will not become the bottleneck of your connection.